Registration: Registration closed. For information on future workshops, sign up for our e-list. Enameling is a timeless art form that involves sifting colored glass onto a copper base and fusing it in a kiln to create shiny, colorful works of art. 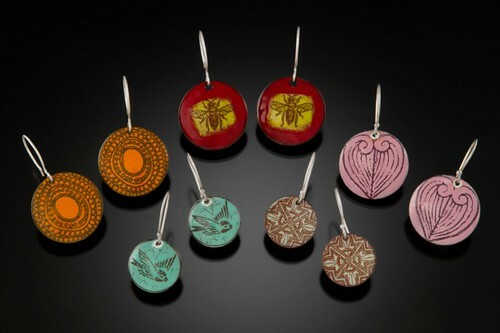 In this workshop, Leslie Perrino teaches the basics of enameling, covering a variety of techniques including stencils, sgraffito, threads, silver foil, screens, and decals. You will complete sample pieces for practice, and can then choose from a variety of projects ranging from wearable items to small bowls. No experience required, and all materials supplied.